FFH is made up of Jeromy Deibler, Jennifer Deibler, Brian Smith, and Michael Boggs. They have recorded ten albums, played over two hundred dates a year, and had some of the highest charting "indie" singles in the history of Christian radio. 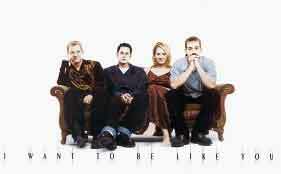 Their major label debut on Essential Records, I Want To Be Like You, shipped over 135,000 units in under five months, making them the best-selling debut Christian artist of 1999. The project's first single, the soaring, acoustic rock track One Of These Days, quickly became a No. 1 multi-format hit. The intense, melody infused follow-up single, I Want To Be Like You followed suit and reached #1 in a matter of weeks. In the midst of all that, FFH wrote and recorded a song used in a Coca-Cola national radio advertising campaign that aired on over 4000 radio stations, and were selected to perform live as the special musical guest at the annual press conference announcing the 1999 Gospel Music Association Dove Award nominees. Heavy press attention, including a Release Magazine August/September '99 cover feature, introduced them to a whole new audience, while the increasing demand for their live performances quickly pushed their roadshow into overdrive, sending them zigzagging around the country to play 250 dates this year. At a recent mall appearance in Dallas, FFH pulled in over 3000 fans, outdrawing even the group N'Sync. Hailed as the hottest recording act of 1999, FFH offers tight harmonies, honest lyrics, and a distinctive acoustic pop sound that reaches straight into the human heart with Jesus' love. Includes "Daniel," "Be My Glory," and "When I Praise." "Have I Ever Told You"
Signature vocals and acoustic-driven pop melodies have made FFH one of the most recognized young groups in Christian music. With their third release, Have I Ever Told You, FFH expands both musically and lyrically. Maintaining a consistent focus and sound, while stretching the boundaries of their creative spirits, the group challenges listeners to investigate the many facets of FFH and the exciting dimensions of a life devoted to Christ. Ready to Fly, co-produced by Jeromy Deibler along with friends Scott Williamson and David Hamilton, also reflects a new freedom for FFH musically. While maintaining the signature vocals and acoustic-driven pop style, Ready to Fly also ventures into new territory with piano-based melodies, intricate harmonies and many more surprises. Jeromy Deibler, the main song writer for FFH, comments on this newest project, sure to be a blessing to their fans, the listening public and seekers. About Lyrical Content: "This record became a more personally focused record than our other projects. It is about freedom and it's about honesty," says Jeromy. "The songs ended up telling a story about where we are with the Lord and where we are with each other right now." About Song Compositions: ""I think listeners will notice stylistic diversity on this CD. Piano is what I've written our songs on thus far, so, incorporating for the first time my piano playing into the recording process is more of a natural progression than most people may initially realize." Jeromy and Jennifer Deibler became parents and were blessed with little Hutch Deibler. Brian and Allyson Smith also welcomed the arrival of Madison Smith. FFH's current single "Good To Be Free" is heating up Christian Adult Contemporary and Inspirational radio charts. March 9th - "Ready To Fly" tour was off to a great start to a sold out crowd of hometown fans in Nashville, Tenn. Featuring Fervent Records' Big Daddy Weave and Creative Trust Workshop's Warren Barfield, the "Ready To Fly" tour will visit over 20 markets in the next two months. Summer Events: FFH could be seen at festivals and fairs all across the country. Brian Smith and his wife Allyson are celebrating the birth of the newest addition to their family, a new daughter, Elaine Grace-"Ellie" for short. 18 month old Madison welcomes her new baby sister too! "The group's latest release, produced by Mark Miller (Sawyer Brown, Casting Crowns) and Scott Williamson (Point of Grace, FFH), communicates the heart of FFH in the powerful title track. Still the Cross also delivers signature vocals, upbeat pop melodies, and inspiring lyrics that point to the hope and joy found in Christ." FFH began more than 12 years ago with a mission to "reach as many people for Jesus Christ as they can, as quickly as possible," with their newest release STILL THE CROSS in stores September 28th, that mission is still the band's ultimate priority. It's still all about the cross. Find out more about the album and hear it at essentialrecords.com/stillthecross. I think FFH is AWESOME!!! They played in my school before they became a real big group at Youth Explosion in Fredericktown, MO!! I think FFH is one of the coolest christian groups ever!!!! I also saw them live in Farmington at a concert! Hi~ I just wanted to say how much I enjoyed the concert that FFH put on! It was WONDERFUL!! And when Jeromy got to the part about how his friend who died in a car accident and he said that God did it for a reason to wake him up and to realize what was going on, it made me realize the same. One of my friends just died a week ago and I was having a VERY hard time dealing with it. I knew that he had a reason and plan for her to leave earth and be with him, but I was just having a really hard time with it all! But now I realize why he did what he did, and I have also realized that I will see her again some day!! And I love them for sharing the story they did, because they changed my life in so many ways they would never know!! God Bless Them!! Sincerely, Desiree Smith~ Moore, Oklahoma! I'm a true fan of FFH, I went to see them in concert with my youth group at church and they are awsome. They changed my life completely. And I just got saved! My favorite song is "One of These Days", we sing that at my church a lot, I'm even doing a solo for my choir on that song. I just recently got there new cd for Easter and its great! I love "Daniel". I would love to learn and see more about FFH.They make me see God more in my life. They are the reason that I got saved. FFH is a great band I love them and I think their music is very uplifting. Don't stop what your doing. I love FFH. I went to go see them live in August and I just thought they were awesome. That was the first time I have seen FFH and I knew right then that I had to get the cd that they were selling and I prayed to God that I got to get it signed by them. Their such an inspirational group and their music just says it all. Thanks FFH. I have seen FFH in concert many times and never get tired of the message that they give. I've gotten to speak with them personally and I can tell that they live what they preach. They have a love for their adience and most of all for the Lord that is so obvious to see. I would highly recomend their cds and their concerts to anyone. I think FFH is the best christian group ranking with the best of the best like CARMAN. I would love to hear more about them! FFH is a really cool group. They have a passion for Christ and their music can tell you that. There music is so awesome because it can relate to anyone. I bought the cd for a friend of mine who isn't a christian and he really enjoyed it and now he is full of questions concerning our Christ. FFH is great. God bless you all. Yeah , I got to say "FFH is Awesome" I finally bought their CD "I found a Place ", It is a big thing in my life right now , I have limited my life to only Christian music, and when they came out I definitely know why. Their music is upbeat, inspirational , and altogether the tunes you need to tune into. I saw them play in concert at King's Island during the Spirit Song festival. FFH is awsome!! I heard about it from a friend and puchased the cd. It is great. The songs are all different, but they all have a great message. I listen to it on my way to school and the tunes stay in my head all day. These are the kind of tunes that you don't mind having in your head all day. FFH is Awsome!!!! I JUST FOUND OUT ABOUT FFH AND I THINK THEY ARE SO AWESOME! MY MOM IS EVEN BUYING ME THEIR LATEST CD "FOUND A PLACE" AS A CHRISTMAS GIFT! I HAVE ONLY LIMITED MY LIFE TO CHRISTIAN MUSIC AND ONCE I HEARD ABOUT THEM AND HEARD CLIPS OF THEIR SONGS ON A WEBSITE, I WAS IMMEDIATELY HOOKED AND JUST HAD TO GET THEIR CD! GOD BLESS YOU ALL! Oh my gosh!! I am sooo in love with FFH!! Well my brother is this big chirstian guy and I went to church and younglife and everything was involed in bible studies, but I didn't listen to christian music!!! Well, my brother always brings home cool cd's and he brought home FFH and I was like yes this is awesome! I am soo in love with their music and Jennifer has a beautiful voice!! I love FFH!! My favorite music group is FFH they have inspired me to get more involved in music especially the drums. I have a couple of their CD'S. Their songs sound so good on my big stereo system but, their music also told me that when ever I sin He'll always accept you back, I heard that in one of their songs.